May 1968 was not a franco-french, hexagonal affair. It was a global event. One would speak of it very differently if it had not resonated with, not only the occupied factories decked with red flags, but also with the Tet offensive of February 1968 in Vietnam, the Prague Spring, the student agitation in Poland, the rebellion of Pakistani youth, the anti-war movement in the United States, the last embers of the cultural revolution in China, the massacre of Tlatelolco, to the raised black gloved fists on the Olympic podium of Mexico. 1968 is thus a symbolic date for a propitious instant, when the despotic edifice of Stalinism revealed its cracks, or the anti-bureaucratic struggles of the East, the colonial revolutions in Algeria, Indochina, Palestine, in the Portuguese colonies, seemed to be able to associate with the mobilisation of workers in France and Italy. The reflux of the 1960s opened the path to the counter-attack of the Thatcher-Reagan years. The spectre of the social and profane revolution receded. The time of velvet and sacred revolutions had arrived. 1968 was a year a of uprisings, to borrow Alain Badiou’s expression. To suggest however that all of the protests, social movements, wars of national liberation, revolutions, shared the same aims, methods, context, or that they were somehow all coordinated, would be absurd. But something was in the air, in the background, that served as an agent of resonance and contagion. Struggles of national liberation and “third worldism” were at their height (animated by the Tricontinental movement or OSPAAAL), and the outcry against the US war in Vietnam knew no borders. In North American, insitutional politics was strained to contain radical political challenges, while blacks fought to radicalise the older civil rights movements (and with Martin Luther King’s assassination in early April of 1968, would rise up across the country). South America was seemingly overwhelmed with Castroist guerrilla movements and in 1970, the Socialist Party would win Chile’s elections, apparently offering up the possibility of a social-democratic path to social change. The “developed” world was for its part not immune to the contamination, with France, Czechoslovakia, Poland, Germany, Holland, Italy, Spain, Portugal and Greece all experiencing major radical social and political contestation throughout the 1960s and 1970s. That there was real fear amongst the governing classes is testified to by, among other things, the founding of the Trilateral Commission in 1973. In the Commission’s first published report, entitled The Crisis of Democracy: Report on the Governability of Democracies, it was the increasing ungovernability of the peoples of the “Western” democracies which was at the heart of a perceived crisis. And if “peaceful” measures to secure power were no longer possible or advisable, then reactionary violence was swiftly employed, through counter-insurgency, coup d’états, invasions and mass murder. [Of the last, Indonesia offers perhaps the most intense example, with up to a million people killed between 1965 and 1966, in what began as hunt for Indonesian communist party members. Joshua Oppenheimer’s 2012 documentary film, The Act of Killing offers a chilling retelling of these events, from the “perspective of the killers”. Anwar Congo and his friends have been dancing their way through musical numbers, twisting arms in film noir gangster scenes, and galloping across prairies as yodelling cowboys. Their foray into filmmaking is being celebrated in the media and debated on television, even though Anwar Congo and his friends are mass murderers. Medan, Indonesia. When the government of Indonesia was overthrown by the military in 1965, Anwar and his friends were promoted from small-time gangsters who sold movie theatre tickets on the black market to death squad leaders. They helped the army kill more than one million alleged communists, ethnic Chinese, and intellectuals in less than a year. As the executioner for the most notorious death squad in his city, Anwar himself killed hundreds of people with his own hands. The many months of May in 1968, and the many years that preceded and succeeded this year of uprisings, knew no national limits. To varying degrees, some kind of internationalism was embraced by all of the movements that marked the period. And yet, it is as nationally defined that we present them (without thereby wishing to suggest that their political ambitions where limited by the nation state form). 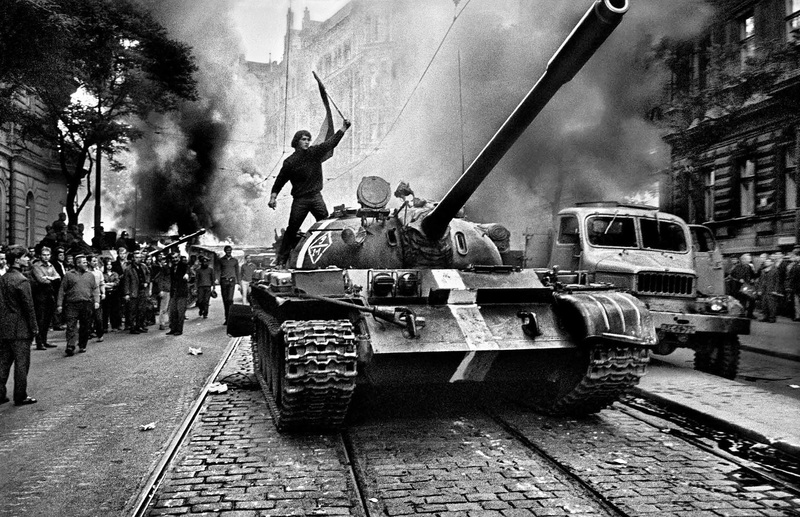 Having begun with France’s May 68, we share below a text that takes us to the Prague of that same year, to recount the “workers’ council” movement, an experiment in “industrial democracy” that would be crushed by the Russian-Warsaw Pact invasion of August 21. However limited the movement was in its impact, and however quickly it was crushed and subsequently domesticated or packed off to oblivion through representations originating from both sides of the “Cold War” divide, the Prague Spring remains one of the most extensive experiments of workers’ self-management of the post-WWII period. The workers of the W. Pieck factory (CKD Prague) wish to fulfill one of the fundamental rights of socialist democracy, namely the right of the workers to manage their own factory. They also desire a close bond between the interests of the whole society and the interests of each individual. To this end, they have decided to establish workers’ self-management. At the time of the [August 1968] Soviet invasion [of Czechoslovakia], two months after the first workers’ councils were formed, there were perhaps fewer than two dozen of them, although these were concentrated in the largest enterprises and therefore represented a large number of employees. But the movement took off, and by January 1969 there were councils in about 120 enterprises, representing more than 800,000 employees, or about one-sixth of the country’s workers. This occurred despite a new mood of discouragement from the government from October 1968. All employees working for at least three months, except the director, were eligible to participate, and the employees as a whole, called the “workers’ assembly,” was the highest body and would make all fundamental decisions. In turn, the assembly would elect the workers’ council to carry out the decisions of the whole, manage the plant and hire the director. Council members would serve in staggered terms, be elected in secret balloting and be recallable. The director was to be chosen after an examination of each candidate conducted by a body composed of a majority of employees and a minority from outside organizations. A director is the top manager, equivalent to the chief executive officer of a capitalist corporation. The workers’ council would be the equivalent of a board of directors in a capitalist corporation that has shares traded on a stock market. This supervisory role, however, would be radically different: The workers’ council would be made up of workers acting in the interest of their fellow workers and, in theory, with the greater good of society in mind as well. By contrast, in a capitalist corporation listed on a stock market, the board of directors is made up of top executives of the company, the chief executive officer’s cronies, executives from other corporations in which there is an alignment of interests, and perhaps a celebrity or two, and the board of directors has a duty only to the holders of the corporation’s stock. Although this duty to stockholders is strong enough in some countries to be written into legal statutes, the ownership of the stock is spread among so many that the board will often act in the interest of that top management, which translates to the least possible unencumbered transfer of wealth upward. But in cases where the board of directors does uphold its legal duty and governs in the interest of the holders of the stock, this duty simply means maximizing the price of the stock by any means necessary, not excepting mass layoffs, wage reductions and the taking away of employee benefits. Either way, the capitalist company is governed against the interests of its workforce (whose collective efforts are the source of the profits), and by law must be. The Wilhelm Pieck Factory statutes were similar to statutes produced in other enterprises that were creating workers’ councils. It was only logical for a national federation of councils to be formed to coordinate their work and for economic activity to have a relation to the larger societal interest. Ahead of a government deadline to produce national legislation codifying the councils, a general meeting of workers’ councils took place on 9 and 10 January 1969 in Plze?, one of the most important industrial cities in Czechoslovakia (perhaps best known internationally for its famous beers). A 104-page report left behind a good record of the meeting (it was also tape-recorded); representatives from across the Czech Lands and Slovakia convened to provide the views of the councils to assist in the preparation of the national law. That democratic character, and the popularity of the concept, is demonstrated in the mass participation—a survey of 95 councils found that 83 percent of employees had participated in council elections. A considerable study was undertaken of these 95 councils, representing manufacturing and other sectors, and an interesting trend emerged from the data in the high level of experience embodied in elected council members. About three-quarters of those elected to councils had been in their workplaces for more than ten years, and mostly more than 15 years. More than 70 percent of council members were technicians or engineers, about one-quarter were manual workers and only 5 percent were from administrative staffs. These results represent a strong degree of voting for the perceived best candidates rather than employees simply voting for their friends or for candidates like themselves—because the council movement was particularly strong in manufacturing sectors, most of those voting for council members were manual workers. These results demonstrated a high level of political maturity on the part of Czechoslovak workers. Another clue to this seriousness is that 29 percent of those elected to councils had a university education, possibly a higher average level of education than was then possessed by directors. Many directors in the past had been put into their positions through political connections, and a desire to revolt against sometimes amateurish management played a part in the council movement. Interesting, too, is that about half the council members were also Communist Party members. Czechoslovak workers continued to believe in socialism while rejecting the imposed Soviet-style system. The government did write a legislative bill, copies of which circulated in January 1969, but the bill was never introduced as Soviet pressure on the Czechoslovak party leadership intensified and hard-liners began to assert themselves. The bill would have changed the name of workers’ councils to enterprise councils and watered down some of the statutes that had been codified by the councils themselves. These pullbacks included a proposed state veto on the selection of enterprise directors, that one-fifth of enterprise councils be made up of unelected outside specialists, and that the councils of what the bill refers to as “state enterprises” (banks, railroads and other entities that would remain directly controlled by the government) could have only a minority of members elected by employees and allow a government veto of council decisions. This proposed backtracking was met with opposition. The trade union daily newspaper, Práce, in a February commentary, and a federal trade union congress, in March, both called the government bill “the minimum acceptable.” In a Práce commentary, an engineer and council activist, Rudolf Slánský Jr. (son of the executed party leader), put the council movement in the context of the question of enterprise ownership. “The management of our nation’s economy is one of the crucial problems,” Slánský wrote. These discussions had no opportunity to develop. In April 1969, Alexander Dubcek was forced out as party first secretary, replaced by Gustáv Husák, who wasted little time before inaugurating repression. The legislative bill was shelved in May, and government and party officials began a campaign against councils. The government formally banned workers’ councils in July 1970, but by then they were already disappearing. This entry was posted in Commentary and tagged czechoslovakia, May 68, workers councils. Bookmark the permalink.